Emergency Service Programs (ESPs), often called crisis teams, provide assessment and intervention to people experiencing a mental health or substance use crisis. This means that they will talk to people who feel they are are in or near crisis, and help them find the supports they need to get better. Their goal is to keep people out of the hospital and in the community whenever possible. Learn more about Emergency Service Programs (opens in new window). The William James Interface is a free service that provides referrals to mental health providers for callers in participating cities and towns in Massachusetts. Learn more about the William James Interface (opens in new window). 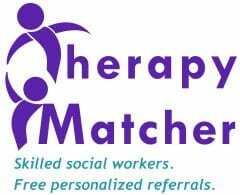 Therapy Matcher a free service that provides referrals to licensed social workers in Massachusetts. Learn more about Therapy Matcher (opens in a new window). Psychology Today is a large online database of mental health providers, groups, and treatment programs. You can filter your search by location, insurance, issue, provider gender, sexuality, age, language spoken, faith, treatment orientation, and more. Learn more about Psychology Today (opens in a new window). The Children’s Behavioral Health Initiative (CBHI) is a set of community-based services for children with emotional or behavioral issues and their families. Families can use the Massachusetts Behavioral Access website to locate providers for many CBHI services. Learn more about the Massachusetts Behavioral Access website (opens in a new window). First Episode/Early Psychosis Programs are a team-oriented care approach designed to treat people who are showing signs of psychosis or who were recently diagnosed with psychosis. The Massachusetts Psychosis Network For Early Treatment provides information about First Episode/Early Psychosis Programs and a list of programs in Massachusetts. Learn more about the Massachusetts Psychosis Network For Early Treatment (opens in a new window). Massachusetts Substance Use Hotline is a free, confidential statewide service for finding finding substance treatment and recovery services. Learn more about the Massachusetts Substance Use Hotline (opens in a new window). Looking for other options for finding providers?